This self-catering house is part of the 400-acre Blyde Wildlife Estate which is situated at the foot of the Drakensberg Mountains and is approx. 16km. outside the town of Hoedspruit (10-12 min. drive). The house has 3 bedrooms and can accommodate 6 guests. There are 3 bathrooms (2 en-suite) with showers. There is also a big outside area consisting of thatch-roof patio, sun-downer deck, swimming pool, dining area, barbeque area and covered parking for your vehicle. You will enjoy beautiful African views from your patio and sun-downer deck and get to admire the game of the estate (giraffes, zebras, wildebeest, warthogs, nyalas and impalas). Our guests will have the assistance of a domestic worker (cleaning, washing, ironing). We can also arrange various trips & excursions (hot-air balloon flights, game drives, river rafting, etc). There are also various car rental companies in the area. The estate is situated 16km. (about 10-12 min. drive) from the town of Hoedspruit which is in close proximity to Kruger Park, Blyde River Canyon, God's Window, Pilgrim's Rest and other heritage sites. One can also visit and feed Jessica, the world famous hippo. She is about 10km. away from the estate. Hoedspruit has got a number of restaurants, supermarkets, retail shops as well as various medical services (doctors, dentists, optometrist, physiotherapist, etc). There are daily flights between Hoedspruit and Johannesburg (twice a day) and flights between Hoedspruit and Cape Town (twice a week). all flights are operated by SAA. 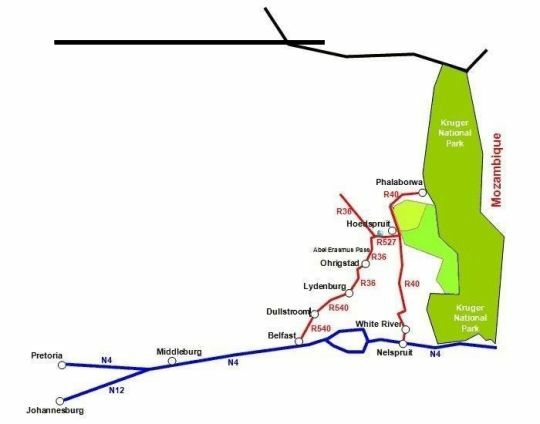 Hoedspruit is about 450km. from Johannesburg (4.5-5 hours drive).